You want to put more money in the pockets of people, particularly when you look at unemployment over 9 percent. But then at the same time you have these deficits that are running at an absolutely frightening rate of a trillion-plus dollars a year. So, you've got to bump up your revenue stream but at the same time you want to keep your money coming into the economy. So how do you reconcile that calculation? It seems not to have occurred to Roberts that the way to avoid either monstrous deficits or suffocating tax increases is to reduce government to a more affordable size. Looking at the details of CNN's survey of economists, it's understandable why they would want the tax cuts extended. Their average forecast is for unemployment to be just below 9% at the end of next year, a full fifteen months from now, with a quarter of those surveyed seeing the unemployment rate still at 9.5% or higher in December 2011. As for the consequences of letting the tax cuts expire, just today, the Heritage Foundation released a comprehensive study showing that the tax hikes envisioned by President Obama would lead to slower economic growth, lower family income, higher interest rates and a loss of an average of 600,000 private sector jobs each year from 2011 through 2020, or 6 million fewer jobs total. Liberals are already trying to frame the deficit debate as one of making sure government has the money it needs to pay for the vast expansion President Obama and congressional Democrats achieved over the past 19 months. A fair and balanced news media would put much of the onus on liberals to backtrack on their massive spending commitments before requiring the beleaguered private sector to kick in an even greater share. 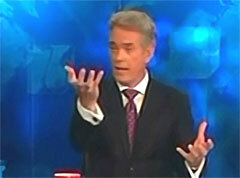 JOHN ROBERTS: Seventeen minutes now after the hour. We have 110 days until the Bush tax cuts are set to expire and the debate over whether to extend them has absolutely consumed Capitol Hill. The strongest impact will most certainly be felt in the bank accounts of millions of Americans. CANDY CROWLEY: Minding your business this morning, CNN/Money's Paul La Monica. President Obama is suggesting that the tax cuts should expire only for the richest 3 percent of taxpayers but there are economist who say that may not be the best idea. [turns to La Monica] So, is it? PAUL LA MONICA: Yeah, we surveyed 31 leading economists and a majority, 18 of them, said that their top priority if they were a Washington policymaker would be to extend the tax cuts for everyone. ROBERTS: So in terms of extending the tax cuts and what that does for the economy, run the numbers for us. You have got an example here. LA MONICA: Yeah. You have a middle class family, $75,000, you know, two children, you would have about $2600 in higher taxes if the cuts are not extended. ROBERTS: So - for the average family that's a lot of money, but particularly in these hard economic times, when you know you are worried about, 'Am I going to keep my job,' 'Should I buy that,' - to not to get hit with an extra bill of $2600, that's substantial. LA MONICA: Definitely, that's why I think there is such urgency in Washington to get something done. It does seems that the main issue is, obviously, just trying - whether or not to extend them for everyone or to exclude the wealthiest top percent of the country. I mean a lot of people both Democrats and Republicans think that extending it for the middle class is obviously the right thing that has to be done, particularly in these tough times. CROWLEY: You know those tax cuts are already in place, so I'm going to assume that keeping them doesn't really change the job market, it simply - the argument is [if they expire] things will get worse for America. LA MONICA: Exactly. It's similar to two years ago when the financial crisis was really first starting to take hold, a lot of things that Washington or you know, was hoping to do right now is preventing the economy from deteriorating any further. I mean we've had obviously hopes of a recovery earlier in the year that have started to fade this summer. And that's worrying a lot of people on obviously, you know, in Washington and on Wall Street. ROBERTS: So when you look at the calculation, Paul, you've got your rock and you've got your hard place. The rock being you want more money coming in to the economy itself so you want to put more money in the pockets of people, particularly when you look at unemployment over 9 percent. But then at the same time you have these deficits that are running at an absolutely frightening rate of a trillion-plus dollars a year. So, you've got to bump up your revenue stream but at the same time you want to keep your money coming into the economy. So how do you reconcile that calculation? LA MONICA: Yeah, that's very difficult. It's the classic short-term versus long-term solution right now that people are trying to weigh. What is more important? A lot of people that we have spoken to at CNN/Money say that really Washington has to do everything in their power to help the middle class extending these tax cuts is likely something that can do that even though it could add to the deficit in the short-term. The hope, and admittedly it is something that could bear out over time but you know, you don't know for certain is that if the economy starts to finally pick up some steam and consumers spend more, primarily because maybe they aren't getting this bigger tax hit, the deficit could help take care of itself, because a stronger economy leads to higher tax revenue from not just individuals but businesses over the long haul. CROWLEY: Paul, thanks so much for breaking it down. Appreciate it. -Rich Noyes is Research Director at the Media Research Center. You can follow him on Twitter here.